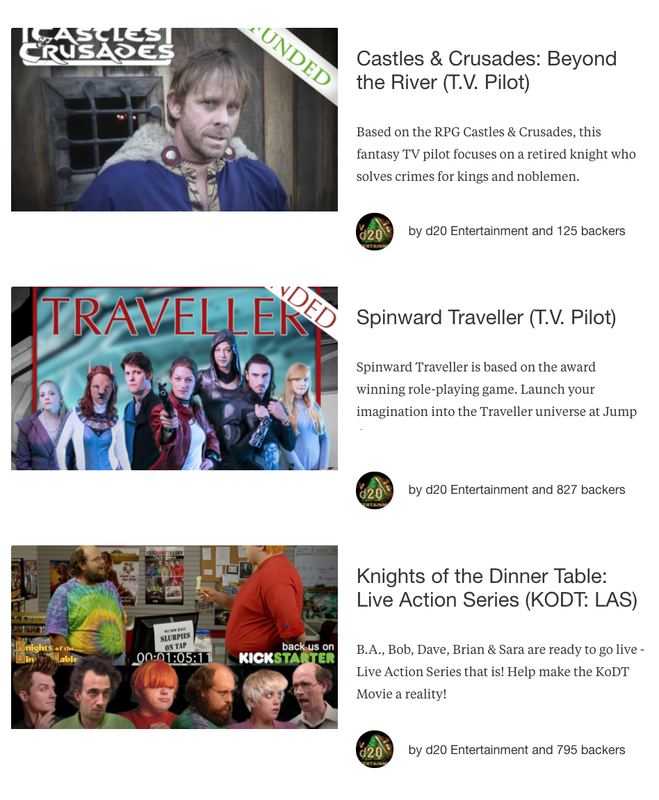 Tenkar's Tavern: Is There a Project Creator with more Abandoned / Failed Kickstarters than d20 Entertainment? Is There a Project Creator with more Abandoned / Failed Kickstarters than d20 Entertainment? Someone brought up an interesting question a few moments ago. Anyone know of an individual or company with more abandoned/failed kickstarters than d20 Entertainment? (they have six failed projects and had two more readied to launch). I can't think of anyone that comes close. This is really a question about Kickstarter's ability (or inability) to get in front of project creators with so many red flags around them. -The last three projects overlapped in funding periods. Because, you know - the monies. -Not one of these projects has completed, although some Traveller ship models have shipped. Some even shipped to backers. David Hill has racked up an impressive number of failed Kickstarters. He doesn't just not deliver, he sells your product in stores. Right? Better to be clear in the difference between David A. Hill of Mothshade and David A Hill Jr of Machine Age Productions who has at least 3 abandoned kickstarters (maybe many more - I cannot tell). Those are two VERY different people. Speak my name and up I pop. Thank you for having my back, men. Could not find anyone to match or beat 5. 5th Street Games / Phillip Kilcrease came really close with 5 funded projects and failed to deliver. There were also a couple of Kickstarters that he funneled through 3rd parties as well. True. (That we know of). 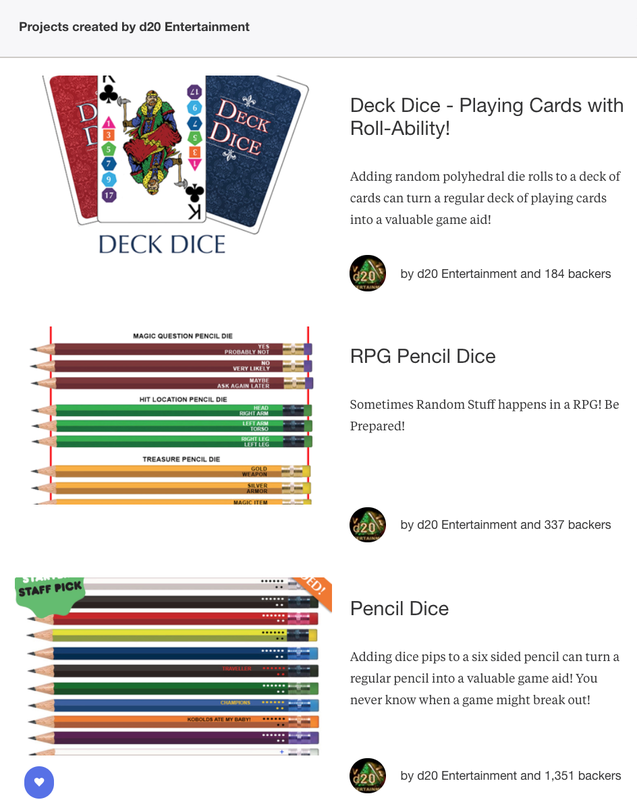 The "dice-o-matic" Kickstarter was started by Ken, but through a different account (not d20 Entertainment). It was shut down because it violated KS rules. Specifically: "Resale. All rewards must have been produced or designed by the project or one of its creators — no reselling things from elsewhere." (the "dice-o-matic" was just some cheap piece of crap readily available all over the Internet that Ken was fraudulently selling as an original invention). He had an add-on for a dice bag for this one (spoiler: did not get). I did get the actual game, though not everybody did. I also got a 50% refund for the dice bag with a promise to still send it out, mainly because I asked about it through the KotD LAS "contact" link while that KS was running, and I think he didn't want to be found out. he also did the Knights Quest Family Card Game. It delivered, but was badly flawed. It was an Uno variant with special rules for nearly every card. Some of the cards were exclusive to the Kickstarter edition of the game. Those cards were in the final printed rulebook, but not all of the non-exclusive cards were in the rulebook. It was slapdash and unplayable as written.